Luminato and Unsound's biggest conceptual draws are the ways they seek to create new ways of experiencing art and performance, especially in a quickly saturating music festival market. Re-appropriating the decommissioned Hearn Generating Station was a stroke of genius, as within the walls of the crumbling, secluded building lies a perfect venue for artistic experimentation. 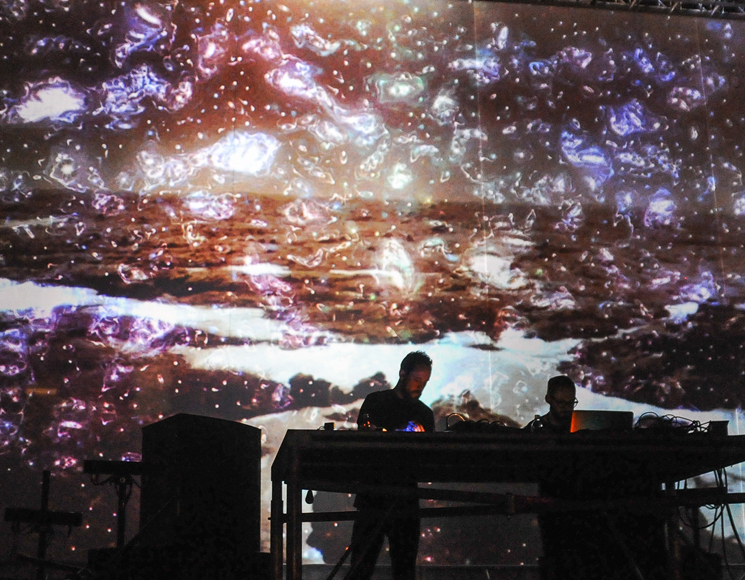 British producer Roly Porter and visual artist MFO proved that thesis as they worked together to create a total, massive audio-visual experience that cemented the venue as an innovative platform for high-calibre experimental art. Porter's seismic bass-heavy soundscapes toyed with the notion of ambient music as beeps, hums and electric crackles gave way to twisting torrents of cacophonous roaring. It was an unsettling and mind-blowing display of sonic totality, bolstered by the gigantic screen broadcasting MFO's visuals. The Berlin-based video artist, born Marcel Weber, was an equal partner in the performance, sharing the stage as he crafted a series of sweeping landscapes somewhere between 2001: A Space Odyssey's cosmic trip sequence and an iTunes visualizer. The two complemented each other beautifully, but were able to use their collaboration to achieve something greater. The aforementioned coup de grâce took place late in the set, as MFO's visuals subsided to reveal a message asking the audience to stare toward a series of blinding fluorescent lights and close their eyes. With eyes closed, the typically communal experience of a live performance was rendered individual as participants were forced to stand still, put their phones and friends aside, and just listen to Porter's haunting soundscapes as the flickering lights wreaked illusory havoc on the insides of eyes. It was a fantastic display of two great artists, both pushing the boundaries of their chosen media, working together to evaluate the idea of a concert as both a sonic and visual experience — yet another reason why Unsound and Luminato are among Canada's most vital festivals.